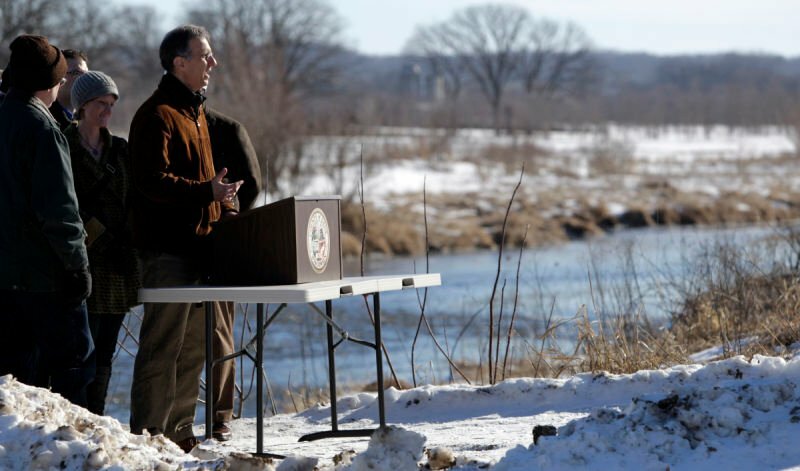 Dane County Executive Joe Parisi speaks at a press conference Monday along the Sugar River at The Bruce Company in Verona. 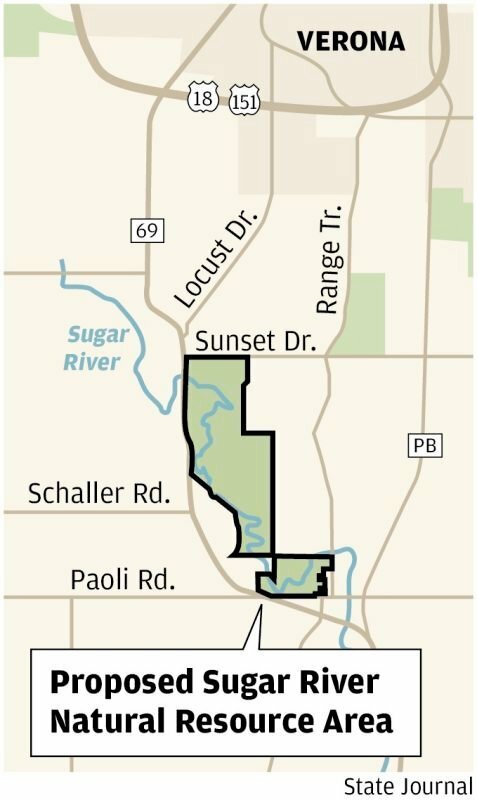 The county is planning to purchase 340 acres for $3.1 million while an additional 126 acres would be placed in a conservation easement to limit future development. PAOLI — Standing on a bridge over the rapidly flowing Sugar River Monday morning, Joe Parisi didn't try to hide his excitement that Dane County is planning a historic acquisition of river frontage for preservation and public use. "It helps preserve what's special about Dane County," the Dane County executive said of the county's agreement with The Bruce Co. to acquire and permanently protect 466 acres along 2.5 miles of riverfront on the Sugar River in the towns of Verona and Montrose. The county is planning to purchase 340 acres for $3.1 million while an additional 126 acres would be placed in a conservation easement to limit future development, according to the agreement. If approved by the Dane County Board, the purchase would be the county's second-largest acquisition of land for conservation and its largest acquisition including river frontage. The land and river would be open to the public for fishing, hiking, canoeing, cross-country skiing, hunting and trapping, according to Natural Heritage Land Trust's Jim Welsh. He added that Knowles-Nelson Stewardship funds will be used to secure additional funding for the project. "This will truly be a destination for people in Dane County and beyond," said Parisi, who announced the agreement during a press conference in the crisp air Monday morning. He added the property also could someday be a destination for biking, camping and other recreational activities. The land, which may include historic Native American burial sites, is bordered by Sunset Drive to the north, Highway 69 to the west and Paoli Road to the south. The east border reaches to Range Trail when the 126-acre conservation easement is included. The Bruce Co. has owned the land for about 25 years, according to Bliss C. Nicholson, the president and CEO of the Middleton-based landscaping and garden store company. It once had plans to build a 27-hole golf course on the land but never gained local government approval. It has used the land for its nursery and still owns 600 acres nearby that it will continue to work. Nicholson said The Bruce Co. was eager to protect some of its best land from development and share it with the county. "We think it's a privilege," he added. The Sugar River offers some of the best trout fishing in the area, said Topf Wells of Trout Unlimited, adding that the land is less than a 30-minute drive from Downtown Madison. He said the universal reaction to the agreement will be "wow, wow, wow."